Yesterday, a horse with forced impaired vision crashed onto a car through the windshield in Central Jaipur, Rajasthan, India. The reason for this mishap occurred due to heat the horse could not withstand plus his head was covered with the feed bag hampering his vision. The feed bag tied to his face and mouth, hindered his vision while he ran with the bag left by the horse owner. It was a scorching day with mercury touching 43.6 degrees Centigrade. The horse broke his secured rope and ran helter-skelter with the bag tied to his head. The feed’s dust got into animal’s eyes and obstructed a clear view. In its melee, the horse hit two bikes at the crossing and hurt the bike drivers. Due to the accident, the horse got more upset and ran about and was directionless. It reached the Jacob road in the blindfolded race. The blindfolded dash of the animal terrified the vehicle drivers on the road. There were wild but scary noisy and scenes on the road. People started to throw water on the animal, but the horse remained uncontrolled. A big hue and cry followed with people running for safety all over. No one could guess the horse’s next direction. A car on Jacob Road in civil lines was the next object on the free and severely handicapped horse. It struck from the front on the bonnet and then slid onto the windshield, broke the windshield and landed on the front left seat through the glass windshield underpinning the driver named Pankaj Joshi. The horse got lifted out with a great difficulty and brought out by the passer byes and the crowd that gathered there from the left side door as shown. 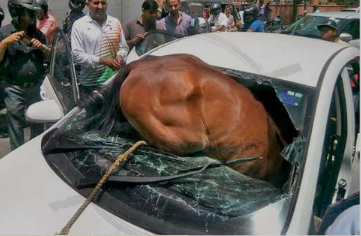 The car owner got pressed under the horse with hands and feet under the horse.The driver was alone and got splinters of glass on his person and minor injuries. The car got damaged extensively, and the horse calmed down after the injury. The Police were summoned, and they were able to take charge of both, man for the first aid and the animal taken to the animal hospital for the treatment. The Story Of How Small Things Make Us Feel Happy Had Gone Viral! 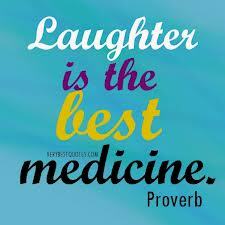 Everything You Need To Know About Laughter Yoga-Need Of Today. Laughter is the Dawn of Life.